Keep with the trend of giving some tasty little tid bits about different foods I figured I would pick one of my summer favourites. I know I have talked about delicious this one is in the past but I didn’t get any further than that. Well friends, I am talking about watermelon. The glorious orb of sweet watery goodness. 1. Good for your heart – Watermelon like tomatoes are full of lycopene. Lycopene has been proven to be responsible for helping keep your heart healthy so load up! 2. It will load you up with energy – watermelon contains vitamin B6. B6 is used to help convert proteins into energy giving you the boost you will need to keep moving through your day. 3. 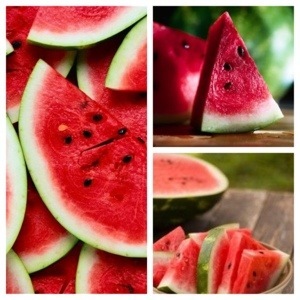 Cancer fighter – watermelons have been proven to have some of the highest amounts of lycopene of any fresh fruit. Lycopene has not only been linked to heart healthy, but it has also been linked to cancer prevention, in particular to the prevention of prostate cancer. So boys and men of the world out there get eating. 4. Great for weight loss – Every 100g serving of watermelon has only 30 calories. Although the fruit is high in sugar it is primairly made up of water helping your body to feel satisfied earlier and with less. So not only is it refreshing but it might also help you when to resist that “snacking” feeling. 5. Keeps you healthy – Watermelons are full of vitamin C which plays a huge roll in your body’s immunity and healing. No one likes a summer cold so make sure to stock up on watermelon while it is in season to keep you healthy and your immune system strong. I am sure none of us need another reason other than “it’s delicious” to keep eating watermelon, but if you did I hope these five reasons have won you over! Have a happy long weekend!! This entry was posted in Food and tagged cancer fighter, five a day, fruit, health, healthy-living, hydrate, hydration, nutrition, summer, vitamin, Watermelon by healingginger. Bookmark the permalink. I know this is off subject nevertheless I just wwanted to ask. The blog does take a lot of work coming up with topics and researching and forming opinions, as for the programming and back end of things wordpress does a great job of taking care of that and makes it pretty easy for us bloggers.